At Ida Lee Recreation Center in Leesburg, the Town offers a children's performance series with shows just about each month. It is usually toward the end of the month, during the week, and from 10-11. Clearly, they are targeting preschoolers - but there is no real "age limit". My daughter (now 6) has made it to a few shows with us, but mostly I use this for a special event with my preschooler. Shows vary each month. My son and I have seen children's musical groups and dancers, puppeteers and today there was a live animal encounter with Wildlife Ambassadors. 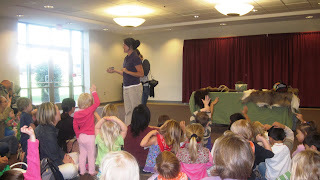 Wildlife Ambassasdors was formerly known as Animal Ambassadors, but has changed it's name and is now a non-profit organization bringing animal shows to groups like libraries, schools and scout groups. Mowgli: An African Grey Parrot. These birds are found in the rainforest, far away... or in pet shops and zoos close by. We're told he talks, but it is more like a whisper, so only a few people heard him - and that wasn't me. In addition to talking, he apparently mimics all kinds of sounds, including cell phones. We learned that their claws are very strong, the speaker showed us that he can easily hang upside down from her fingers (or a tree branch in the wild). These birds use their claws like we use our hands - to hold things and even to bring their food to their beaks. Kelly: Kelly is a Fennec Fox, found in the North African dessert. Her fur is the color of sand, making it hard to find her in the wild. They are actually quite small and very pretty, but at least this one was a very timid animal - it was hard to keep the children quiet so she wouldn't tremble. Ms. Tiggy: She's a Hedgehog. I had no idea just how cute those little things were! 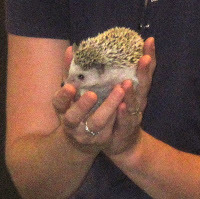 They have a prickly coat to fend off enemies. Gus: I think it was Gus that we met.. he's a Oppossum (with a silent "o" - who ever heard of a silent "o"?) Oppossums are noctoral animals and do live in our area. One might even live in your yard or down the street. They might be found the night before trash pick up rumaging for food in your trash cans. If you catch them, at first they will hiss at you and show their teeth..... but if you don't run, they will become very frightened and play "possum"... roll over, close their eyes, open their mouths, their tongues will hang out and they will play dead - very convincingly. This animal is a marsupial, and at birth was only the size of a bee. Full grown, they are bigger than most cats. 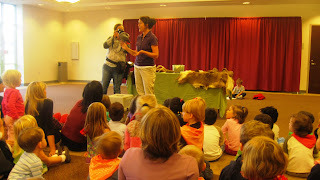 The children enjoyed seeing the animals close up, although they were not allowed to touch the animals - probably because of the age of the children and the restrictions of Ida Lee. There were other donated items for the children to touch - an Ostrich egg, deer pelt, antler, and a horn, all these were donations to the organization and provide opportunities for children to touch without any risk. It was a great show! Next month's show is October 27th, and will feature "Monster Madness" by Bob Brown Puppets. Too bad we're going to miss it... it looks like we have to go to Disney World that day. I know, don't you feel bad for us? :-) But, if you're going to be in or around Leesburg, I encourage you to check out this show. It should be really fun. The cost is $6 if you buy tickets in advance, $8 at the door.... and you pay only for the children, one chaperone is permitted for free with each child. Not a bad deal. Enjoy! Hysterical update: Tonight, I took my kids to my dad's for dinner. My dad is a great hunter. In his basement are many trophies. I showed them to my son, Devon (3 yrs old) who was modestly impressed - he'd seen them before. But, just as we started to walk up the stairs, Devon pointed to the old piano in the corner and started getting very excited "Look, Mommy! Look!"... I couldn't figure out why he was excited. "It's a flat animal just like at the puppet show today!" He was referring to an albino deer pelt draped over the piano... and comparing it to the deer pelt seen at the show today - look in the photo above on the right side of the table. Again, let me assure you the show was a LIVE animal show, not a puppet show... but he doesn't really know what a puppet is, and he thinks every show we see there is a puppet show since that is what the first one was.